58. 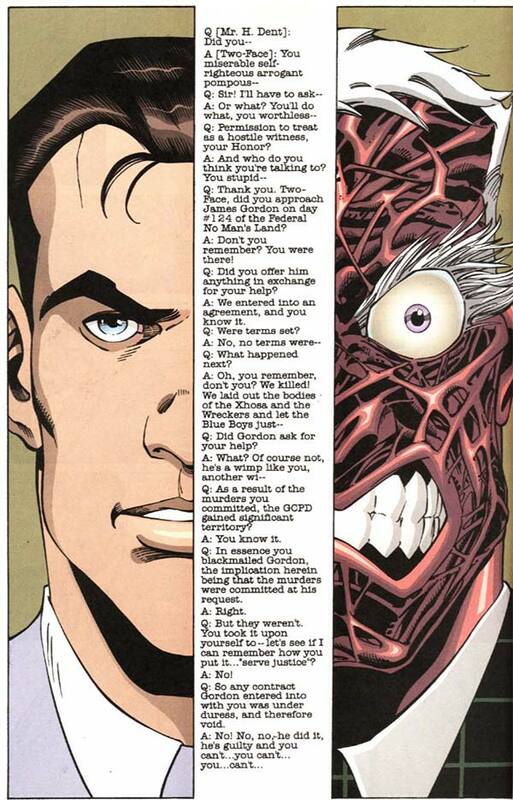 Harvey Dent argues against Two-Face (Detective Comics #739, collected in Batman: No Man's Land, 1999). Anyway, the lawlessness of No Man's Land provided the perfect opportunity for Two-Face to set up his very own courtroom, which never ceases to amuse me. Frankly, I think the writers could've milked this a little more for what it's worth (perhaps they did in the issues that weren't collected in the trades.) But what I think makes Two-Face the "scariest" (when written correctly) villain is, that, like Batman, he believes in justice, albeit a darker shade of justice. Vigilante heroes, by definition, operate outside the law to administer justice when the legitimate justice system can't. Why should Harvey Dent's version of vigilante justice be any less legitimate than Batman's? It is a bit over-the-top, but, hey, it's Gotham, so what do you expect? Ha! I remember that part! I loved that issue with the q and a pages.